NEBNext® Q5 Hot Start HiFi PCR Master Mix is the original hot start NEBNext formulation of Q5 High-Fidelity DNA polymerase. This formulation is also included as a component in all of the original NEBNext Ultra kits, for DNA and RNA library preparation. However, the NEBNext Ultra II Q5 Master Mix (NEB #M0544) is now available, and this more recent hot start formulation further improves the uniformity of amplification of libraries, including superior performance with GC-rich regions. The NEBNext Ultra II Q5 Master Mix is also included as a component in all NEBNext Ultra II kits, for DNA and RNA library preparation. NEBNext® Q5 Hot Start HiFi PCR Master Mix is the original hot start NEBNext formulation of Q5 DNA polymerase. This formulation is also included as a component in all of the original NEBNext Ultra kits, for DNA and RNA library preparation. The NEBNext Ultra II Q5 Master Mix (NEB #M0544) is now available, which further improves the uniformity of amplification of libraries, including superior performance with GC-rich regions. The polymerase component of both master mixes, Q5 High-Fidelity DNA Polymerase, is a novel thermostable DNA polymerase that possesses 3´→5´ exonuclease activity, and is fused to a processivity-enhancing Sso7d domain. Q5 also has the highest fidelity available (> 280-fold higher than that of Taq DNA Polymerase), resulting in ultra-low error rates. This convenient 2X master mix contains dNTPs, Mg++ and a proprietary buffer, and requires only the addition of primers and DNA template for robust amplification. The inclusion of the hot start aptamer allows convenient room temperature reaction set up. 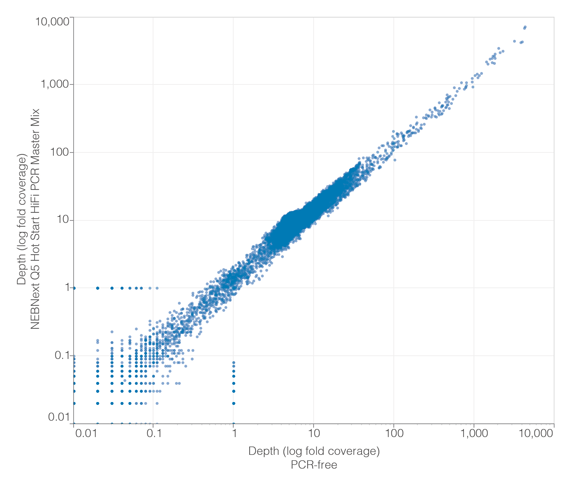 Average depth of coverage of each 10 kb window of the hg19 reference genome is plotted for NEBNext Q5 Hot Start HiFi PCR Master Mix on the Y axis, and correlated with the number of reads from a library prepared without an amplification step (PCR-Free) on the X axis. Libraries were prepared using the NEBNext Ultra DNA Library Prep Kit (NEB #E7370), sequenced on a HiSeq® 2500 mapped to the hg19 reference genome (Bowtie 2.1.0), duplicate marked (Picard 1.56), and downsampled to 420M reads (Picard 1.56). Reads on each 10 kb interval of hg19 were counted using Bedtools (2.19.1), and average coverage was calculated by dividing read bases the interval length (10 kb). Libraries of human (IMR-90) or E. coli K12 genomic DNA were unamplified (“PCR-free”) or amplified using NEBNext Q5 Hot Start HiFi PCR Master Mix, and sequenced on an Illumina MiSeq®. GC bias plots were generated, with %GC content of 100 bp windows on the X axis. Normalized coverage is indicated by the blue circles, %GC of the reference sequence indicated by the red lines and base quality at %GC indicated by the green line. Similar GC bias was observed for the libraries amplified with NEBNext Hot Start HiFi PCR Master Mix compared to PCR-free libraries. NEBNext Q5 Hot Start HiFi PCR Master Mix, DNA template and 0.5 μM to 1.25 μM primers (depending on sample input) in a total reaction volume of 50 μl. An E. coli strain that carries the Q5 DNA Polymerase gene. To ensure optimal performance, themaster mix should be thawed and resuspendedprior to use. Stability testing using up to 30 freeze/thaw cycles has shown no negative effect onmaster mix performance. The NEBNext Q5 HotStart HiFi PCR Master Mix may be liquid at –20°C. What’s New About NEBNext® Q5 Hot Start HiFi PCR Master Mix? What types of beads can be used with NEBNext® Q5 Hot Start HiFi PCR Master Mix? Is NEBNext® Q5 Hot Start HiFi PCR Master Mix the same as the Q5® Hot Start High-Fidelity 2X Master Mix (M0494)? Is NEBNext® Q5 Hot Start HiFi PCR Master Mix the same as NEBNext® High-Fidelity 2X PCR Master Mix (M0541)? Is NEBNext® Q5 Hot Start HiFi PCR Master Mix the same as NEBNext® High-Fidelity 2X PCR Master Mix (M0541), or Q5 Hot Start High-Fidelity 2X PCR Master Mix (M0494)? Do I need to make any changes to the cycling conditions for my NGS library amplification I have previously been using with Phusion High-Fidelity PCR Master Mix? 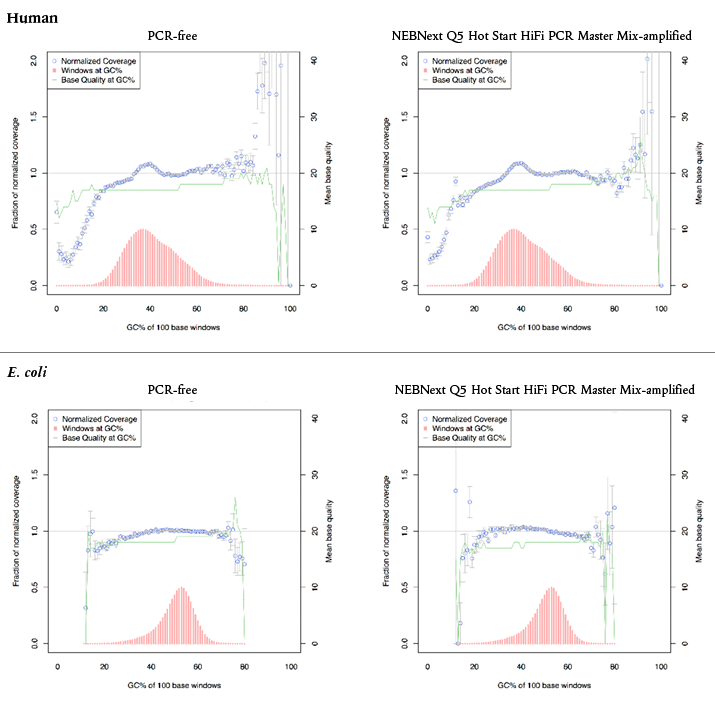 How many cycles of PCR should I perform with NEBNext® Q5 Hot Start HiFi PCR Master Mix? Are the DNA products produced by NEBNext® Q5 Hot Start HiFi PCR Master Mix blunt-ended or do they have a single base 3’ overhang?